Below is a rough transcript of my "From CNC to NTC: A Journey of Professional Growth" session I presented at the 2017 Nutanix Next conference. The slide show is embedded below, and I've included some links which could be helpful on your journey. I hope you enjoy! So, what are we going to talk about today? Today’s post is one about growth, living up to your potential, and getting out of your comfort zone. It's a story about that guy in the green, that's me 6 years ago. Working as a CNC operator for an envelope factory in Milwaukee. Yes, envelopes are still made here in the United States, I was surprised to find that out in 2004 when I started with the company. 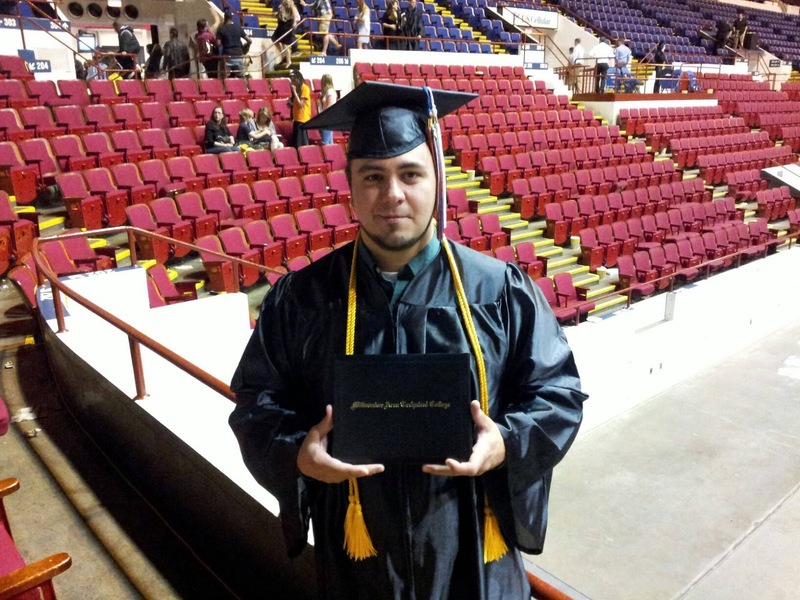 I started working right out of high school instead of pursuing a college degree. After bouncing around from a couple of part time jobs, I landed a rather nice paying full time gig at 19. In high school I was an above average student, but honestly, I lacked motivation and focus. So, when the opportunity to make $12 an hour at 19 years old presented itself, I thought, “Wow, it’s my lucky day”. And the first couple of years, I was doing alright. But after those first couple of years, the day to day monotony of the factory work coupled with minimal increases in wages began to take its toll. It’s that point that my wife suggested I go to school and learn something new. Tinkering with and repairing computers was always fun for me, so I thought taking the leap into an IT career would be a logical step for myself. But where would I even begin? Did this move make sense for my life? My family? As this was a huge paradigm shift, I wanted to be sure I was prepared. Logically, leaving the factory life would certainly lead to better pay, and an overall improvement in quality of life. Standing in one spot, pressing the same button over and over again, and repetitively lifting certainly takes its toll on a person. I read through everything I could find online about career change. I spoke to the people in my life who already worked in the field. I talked to the IT manager at work. Their consensus was an associate’s degree was the best place to start given that I had no professional IT experience. Okay a starting point, a 2 year degree, excellent! Where I lived at the time was nestled between two different technical colleges, so again, wanting to make sure I was making the right choice, back to the research. The college I chose turned out to be pivotal in shaping who I became, so I’m glad I took the time beforehand. School picked out, I then I sat down with my wife and looked over the class schedule. As we did not have any children, and my work schedule was set at 7a-3p daily, I was able to easily plan out my evenings of class, studying, and homework. Wanting to make up for lost time by not starting sooner, with my wife’s blessings, and friends motivations behind me, I scheduled class Monday through Thursday, 5p-8p. Yes, 40 hours of work each week and 12 hours of class. Should be easy, right? The first month or so, cake walk. The motivation of where this would all lead coupled with the excitement of learning something new kept me going like a machine. I set the bar high for myself as well. Since I slacked in high school, nothing less than A’s would suffice in college, especially since I wanted to transfer to a 4 year school after the associates. But, that excitement would wear off and the days would get longer, and longer, and longer. With my weekends getting filled with studying and homework, taking time away from my family, I started staying up until 1 or 2am during the week to get it all done. And, as a diehard Green Bay Packers fan, there was no way I was missing a game on Sunday afternoons. It became evident to myself and my wife that I had bitten off more than I could chew. That is an important lesson to learn and to be able to admit to yourself. Honestly, it was a big learning moment for me. Knowing that feeling and still being able to tell to this day when things get to be too much, it helps you keep your sanity. There’s a level of professionalism in being honest about not having the availability to take on additional tasks. It does not show weakness or an unreliability. It shows you are dedicated to what you’ve already committed yourself to and care about the quality of work put into it. And, since I committed myself to 4 nights of class this semester, and I wanted to see it through, it became a matter of time management and organization. Whether you’re pursuing a certification, a degree, or running a project, staying organized and time management are an integral part to success. I cannot stress this enough. Honestly, I hate being micromanaged, as I’m sure many of you listening do as well. But to make it through the remaining half of the semester, I had to sit down and chart my time hour by hour. 8 hours for work, 9 including commute, 7 hours of sleep left 8 hours to divide up between personal responsibilities and schoolwork. Home at 3:30, shower, snack, clean the house, whatever needed to be done until 4:30. Drive to class, class from 5-8, drive home, hang out with the Mrs. for a little bit and decompress. Then it was homework time from 9:30-11:30p. Sleep. Repeat. Monday through Thursday. By Friday I was exhausted, but I could take the night off and do whatever I wanted. Saturday left time for the family and homework if needed, and Sunday, Sunday was football. My reward for sticking to my schedule for the week. Okay, so timings sorted out, now what to do about 3 classes worth of homework, projects, and exams. It’s funny, that syllabus thingy that’s handed out at the start of class really comes in handy if you’re trying to be organized. I, personally, am a visual person. I needed to see my week and month laid out before me, so like any good IT professional, I turned to a whiteboard. In my living room (I was living in a 1 bedroom apartment at the time) was a whiteboard, with a calendar grid taped to it. I took out that syllabus, well 2 of the 3 as I had to get one that I lost from the professor, and wrote down all of the exams and project deadlines on the whiteboard. Now I could SEE exactly when things were due in relation to my other courses and adequately divide up my time. I also kept a daily planner on me as well. As this was a time JUSSST before smartphones, a trusty pen and paper were always nearby. Should any new tasks arise, it was noted, should I need to rearrange my schedule and I didn’t want something to fall by the wayside, it was noted. For a long period of time, I could have told you what I was doing on the 3rd Tuesday in November 2 years prior by reviewing my schedules. On that same whiteboard, I kept notes about each project. Those notes were fairly high level, but as I made progress towards completing each one, I would post at what percent complete I felt that project was at. Seeing this in front of me, coupled with the deadlines, was an easy way to keep myself accountable towards getting it done. If the deadline grew closer and that percentage was not going up, I knew I needed to adjust my schedule and focus on that project. This is a process I still incorporate into my larger work projects today. There’s another piece to my success in that first semester of school, and it happened organically. I ended up with not one, but two people mentoring me. One was a classmate from my CCNA course. He had spent many years in networking and was pursuing the certification as his employer requested. We hit it off right away. He could tell I was new to all of this, so as we worked on labs in the class, or even during lectures, he took the time to explain concepts in greater detail than the professors. We studied together, we worked on labs after hours together. It was an amazing experience. The other mentor was my English professor. All through elementary, middle, and high school, I excelled at writing so I was excited to see how that translated to the collegiate level. I got my first paper back with an “H” written on top. As he was explaining to the class about their grades, he said “Anyone with an H on their paper, see me after class”. Instantly, my heart sank. I thought “H is two letters after F in the alphabet, how bad did I do?”. Reluctantly, I sat in my desk as everyone left. I scanned the room and noted only 2 other students remained. Preparing myself for the worst, the professor began “I bet you’re all wondering what H stands for?” and we nod. He continued, “The three of your papers stood out leaps and bounds above the rest of the class. I would like to submit you for the honors program.”. I probably should have been pulled over for speeding on the way home after hearing that. I was so excited, I knew I was capable of more than just menial factory work, and now I knew I could actually do this. From that day on, the professor and I would chat quite a bit before or after class. He pointed out that my writing style would make me an incredible technical writer, and helped me craft that into a skill so I could easily communicate across the full spectrum of business audiences. That’s something to this day that I am grateful for, as I use it more than you’d think. Finding a mentor is something you’ll hear me mention twice in this post. Having someone who’s willing to guide you that’s not emotionally involved, that’s willing to steer you in the right directions, and help you learn from their experiences. That it worth its weight in gold. In this case, I was fortunate that mentors happened upon me organically. You may not have as easy of a time as I finding a mentor, and that’s okay. It’s also okay to openly ask for someone to mentor you. There are many people in our industry who are more than willing to be a mentor. All you’ve got to do is ask. So, after all of that micromanagement, stress, and reorganizing of my life, how did I do my first semester back to school in 5 years? Straight As, 4.0. Learning from my mistakes, the following semester I lowered my course load to two nights a week. I’m pretty sure that first semester is when I started getting my first grey hairs, and I did not want that trend to continue. It wasn’t an easy road. Life can throw you some curves during this process. I bought a house. My father passed away, my wife and I divorced, and my full time job went from 40 hours a week to 60+ mandatory. It took me going to school part time in the evenings several years to complete that degree. But here I am, graduation day. I was so proud of myself, and I felt so accomplished. All I could think about was continuing my education into a bachelor’s degree. I had worked so hard to ingrain the drive to succeed that I didn’t give myself a moment to breath and enjoy what I had done. Alright, so now I’ve got my degree. Time for that new job, right! Right? I must have applied for 50 jobs and was offered a handful of interviews. 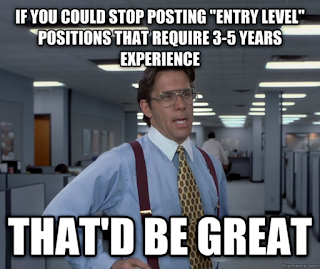 Turns out it’s pretty hard to enter a field you have no professional experience in. This is something any number of you could see in your current situations. It may not be a complete career change, but how do you get your foot in the door at that company you’ve always wanted to work for? How did I finally get that 1 interview that started my career? Networking. Lots and lots of networking. I hate to admit it, but it’s not always what you know, but sometimes it who you know. 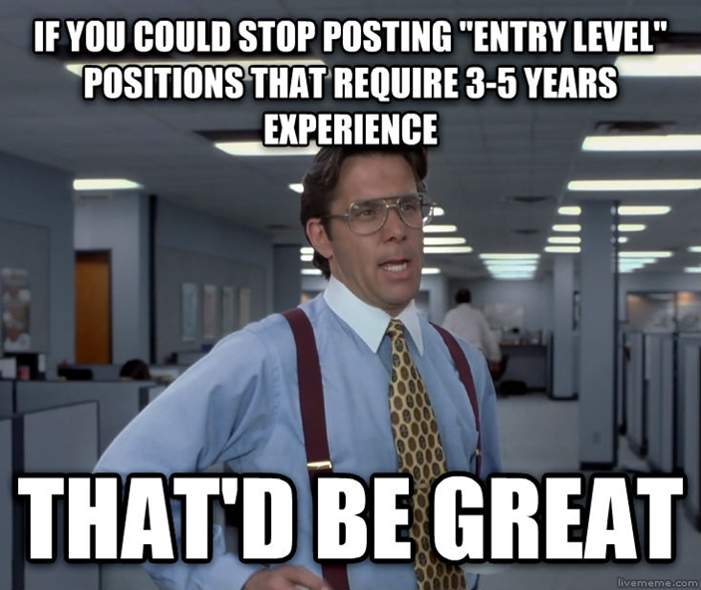 In my case, it was a close friend’s sister’s husband’s friend that was hiring for a position. We had chatted a few times in passing on the rare occasion we were in the same place. I knew what he did professionally, and that he could be a good resource to me in the future. Turns out that investment paid off. Letting people know what you’re about, what you’re looking for, and keeping up that image can go a long way in helping you with your career. I interviewed with a large, multi-national company who was willing to take a chance on a kid fresh out of college who seemed to have the right attitude and motivations. They offered me a position. A three month contract, with a strong possibility of being extended to six months. So here I sat, job offer in the field I was dying to get into with a place that would provide great experience and growth potential. Do I give up my job of 9 years? 9 years of union seniority, fully vested in the 401k, great benefits, and steady income for what? A 3 month contract that could be thrown out at any moment? What about my bills, my mortgage? How much was I willing to risk to make that leap? Times like these, you really need to analyze your risk / reward threshold. As you make any decision in your career, thinking about the balance between risk and reward is a great tool to help you make choices that best suit not only your plans, but style as well. What was I looking at? Yes, I could be in dire financial straits if I ended up unemployed at the end of those three months, but, I was also fortunate enough that the VP of the company I was leaving said I could come back should things not work out. There was still a pretty great deal of risk in choosing to take the contract. What if my former employer rescinded that offer? And more frightening, what if I did take the offer and I completely failed at the new job? To take such a big leap, you’ve also got to be able to stare down any fears of failing. It’s almost cliché to say, but look at times when you fail as learning experiences. If you’ve learned something new, if you’ve grown from the experience, is it truly a failure? So I did it, I accepted the position and put in my two weeks. If I wanted to enter the world of IT, I needed to take that chance. Just about one month from graduation, I started my new career. Identity and Access management. A fancy title for password resets and creating Active Directory accounts. Nothing glamorous, but it was the foot in the door I needed. The first few weeks were fun and exciting, but I could see that I would be siloed in this position. I had to keep growing. As I quickly mastered the original duties of my position, I asked to be taught additional tasks that were performed by our team. This provided an opportunity to show management I was worth more than just a 3 month contract. I did everything in my power to show that I wanted to be a full time part of their team and they could trust me with additional work. And guess what, that persistence paid off. Two months into the contract, the 3 other people who were brought on at the same time as I had their contract terminated early. As I was proving to be a vital resource, my contract was extended. The goal I set for myself when I graduated was that I wanted to be making six figures in seven years or less. A pretty lofty goal. Clearly, I needed to continue to learn and grow outside of my position to make that happen. One of the first things I did was stayed active in the VMUG community. One of the last classes I taken before graduation was “emerging technologies”, which was the colleges VMware certification course. The concept of virtualization blew me away, and thankfully, was a technology that came easy to me. I immersed myself in reading books, blogs, and articles about ESXi and Hyper-V. And this led to another defining moment. I started to build my brand. We are, as IT professionals, are well versed in the importance of networking with each other and getting your name out there. I took it to the next level, not only did I start networking, but I built a brand. Armed with a name, I created a Twitter account, blog, Instagram, and purchased the domain name ExploreVM. I also locked down my personal Facebook and created a “Professional” account that was public. Because let’s be real, how many of us have photos on Facebook they are not proud of? Lots of work went into making ExploreVM and my professional persona, the image I wanted to portray publicly, highly visible. How many of you currently use Twitter? Twitter can be a great tool for networking, keeping up on technology trends, and a pool of resources when you’re in a bind. If you’re not currently using it, I highly recommend you sign up and start to build your brand. Remember, this is a very public facet of yourself. Refrain from rants and getting too political. I’ve muted or unfollowed several bright IT minds in the last year on Twitter as they’ve went from meaningful technical content to political tirades and name calling. We’ve all got our viewpoints, and you’re very much so entitled to yours, but a professional brand is not the place for those opinions. As I Tweeted and blogged, I started to gain a following and was being recognized at events. One of my favorite stories of being recognized was at VMworld in San Francisco. I was walking between vendor parties in the evening when, from across the street, I hear someone yell “Paul Woodward Jr!”. They walked over and joined our group and we had a blast. I made new friends in the industry thanks to being active on social media. Oh, a quick piece of advice. In building a brand, make sure to lock up your name on every platform you can think of. By doing this, it helps people locate you easier when Googling your name and it prevents anyone else from using the same name in a way that could hurt your brand. Think outside of the box as well. Start with the obvious sites: Twitter, Facebook, LinkedIn, but don’t forget about some that might be less obvious such as Instagram, Pinterest, and even outliers like Google+. I know, Google+ is dead, but when running searches, Google gives priority to Google generated content. You can see here that explorevm.com is the first result, followed by Twitter, and what’s that? A share of my blog on Google+ is the 3rd result. All of this helps you stay in the top of the first page. Alright, so now we’ve got a brand, it’s getting recognized, what’s next? In my case, I decided it was time to give back to the community that helped me grow. In 2015, I began speaking at VMUG events. Now, this wasn’t entirely just to give back. Speaking allowed me to continue to grow my brand and earn vendor recognition through programs such as VMware vExpert and Nutanix Technology Champions. The fact that I was able to speak at the .Next conference has a lot to do with my involvement in those programs. The first time I presented I was nervous, stuttered, and was terrified of any sort of audience questions. I suffered from Imposter Syndrome pretty heavily. If you would have told me in high school that as part of my profession I’d be speaking at 10+ events across 4 states, I would have thought you were crazy. Now, I won’t say I don’t get nervous before I speak, but I love to present and look forward to interactions with the audience. I also find it very rewarding having someone approach you after your session, or at a different conference, and tell you that your session helped them address issues they were having. The ability to speak in front of people, and speak with confidence is, I’d say, a crucial tool that we all need in our toolkit. If you’re looking to move up in your company, change careers, or even just pitch your project, solid communication skills are a must. Small user groups and local meetups are a great place to begin. And, despite what you may think, people in the audience are not judging you, there not waiting for you to fail so they can make fun of you, they are IT professionals just like you with a desire to continue to learn. Or at least I hope none of you are judging me too harshly. Well Paul, can you provide us with a real example of how all of this brand building has helped you? Sure! I left that IAM role for a systems administrator position with a small managed services provider in Milwaukee, Wi. Within 6 months, I worked my way into a systems engineer role by passing the VCP, having the desire to always want to learn more, and my rapport with clients. But, despite your best efforts, when the company’s money gets tight and changes need to be made, even the best of us can fall victim to a layoff. In my case, 18% of the workforce was let go, and I was part of it. This happened mid-day on a Friday. As I was pulling out of the parking lot, I was calling all of the recruiters that I had met at various events or that had found my LinkedIn. By Tuesday I was already interviewing with companies. That Monday afternoon I sent out this Tweet. Within minutes I received a direct message from someone who had been following me since before graduation and whom I’d interviewed for my blog several years prior. His company was in need of a datacenter systems engineer and he was wondering if I’d be interested. Thanks to that Tweet, staying social, and building the brand, I was employed again one month to the day of being laid off. I’m glad I took that interview, because Presidio has been a great place to work that has provided me many amazing opportunities to grow. Does that mean I’ve stopped my desire to grow and learn? No way! I’ve taken the brand further. This year I kicked off the ExploreVM podcast, I’ve had stickers and pins made to give away at events, and I seek out larger and larger events to speak at (although it’s going to be tough to beat speaking at .Next!). I still continue to give back as well. I have a few people in my life that I consider mentors, but now I’ve also taken to mentoring people early on in their careers as well. To continue to grow and climb, you need to stay on top of technology trends. We all understand the need to continue to educate ourselves. I entered the field as a Windows admin, migrated to a VMware admin, and now, I’m focusing on datacenter, cloud, and automation. If you’re not learning, you’re leaving. You have to keep up with what’s coming in your field to stay relevant, otherwise you’re going to find yourself on the outside looking in. Now, not all employers prioritize them, but certifications are a great way to learn about new technologies. 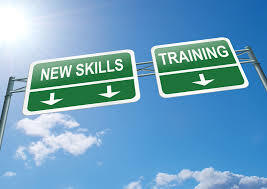 The training for the exams provides a solid foundation into the tech. And, if you happen to take and pass the exam, that new found cert could be the differentiator between you and a co-worker when it comes to a promotion. Here are some tactics that I’ve used for many years to help me approach learning new tech and certifications. Obviously not everybody is the same, but these tips have been the most beneficial. Listening to various podcasts during my commute has provided terrific exposure to new technologies. Also, I’ve started using something called the Pomodoro Technique. Image stolen from Chris Wahl, linked below. I actually learned this technique years ago from Rubric’s Chris Wahl (at a community speaking engagement; the value of staying involved pokes its head out again). Spend 25 minutes in a highly focused state with no distractions, silence your phone and mute email. This will give you enough time to achieve measurable results without burning out your brain. Remember, your brain can only stay focused for short bursts at a time. After 25 minutes take a break. Run to the restroom, grab a snack or beverage, clear those messages, something to relax your brain for the moment. Then, repeat the process. This is a simple method to help you absorb new information. And before we wrap up here, I’d like to offer up one more piece of advice. Help your co-workers strive. “Iron sharpens iron. So one man sharpens another” – Proverbs, I think. Some of the best people I’ve worked with are those who are willing to take their co-workers under their wings and help them. It doesn’t need to be a full mentoring relationship, but at least be pleasant and willing to answer questions. I’ve had co-workers come to me with questions, and after a while, they were apologizing for bugging me so much. My response? “It’s not a problem at all. I’m here to help. And frankly, what would you rather have, a coworker who’s annoyed that you’ve asked them so many questions, or a client who’s mad at you for doing something wrong or incomplete because you didn’t know what to do?” The decision seems simple. Take what you’ve learn online or from conferences and share it with those around your office. Help them stay ahead of the curve and grow technologically. You’ve got the power to help your teammates grow. This will also help you to be looked at as a leader within your company, even if you don’t actually have a leadership role. As you move into this leadership role, whether it be titled or not, be a confident but compassionate leader, but also be willing to be a great teammate. We’ve all worked on great teams in our jobs, and we’ve all worked on terrible teams in our jobs. Recall what made those teams great and apply those traits. Look back on the bad team experiences, what was the cause? Refrain from those traits. Ease co-workers away from those traits. Take charge when needed, but also be ready to follow someone else’s leadership with a smile. Remember, everyone’s ultimate goal is the business’s success. It’s hard to grow at a company that’s failing or no longer exists. If you'd like to join the conversation about career development, have any show ideas, or would like to be a guest, reach out to me on Twitter (@ExploreVM), Email, or on Facebook.